Correspondence Copyright © 2007 Massachusetts Medical Society. To the Editor: We previously reported in the Journal a case of a successful ovarian transplantation between 25-year-old monozygotic twins. One had undergone menopause at the age of 14 years, whereas the other was still fertile.1 After receiving a graft of ovarian tissue from her sibling, the previously menopausal twin conceived spontaneously during the second menstrual cycle and delivered a healthy full-term baby. Subsequently, 10 other pairs of monozygotic twins who were discordant for ovarian failure sought consultation at our center for ovarian transplantation. Four women correspondence had previously failed to conceive after receiving donor eggs through in vitro fertilization (IVF), two also required surgery for fibroids or cysts, and all preferred the possibility of natural conception, the option to cryopreserve spare tissue for future use, and the advantage of undergoing a single procedure. We report on the outcomes of the seven twins who have already undergone ovarian transplantation. All recipients had high follicle-stimulating hormone (FSH) levels and had had amenorrhea for 2 to 26 years (Table 1). In all cases of transplantation, ovarian graft tissue was obtained by unilateral oophorectomy, trimmed to approximately the same dimensions as the resected surface of the recipient ovarian medulla, and shaved to a thickness of approximately 1 mm to facilitate early revascularization. The medullary bed was sutured to the undersurface of the cortical graft with 9-0 sutures to maintain tight tissue approximation. All seven recipients resumed menses (range, 65 to 93 days after surgery), and by day 140 after transplantation, all had regular cycling, with a normal serum FSH level on day 3 of the menstrual cycle. There have been five pregnancies thus far (four were spontaneous and one was achieved through natural-cycle IVF), and the other women continue to have regular menstrual cycles, although after 2 years the FSH levels began to rise. Table 1. 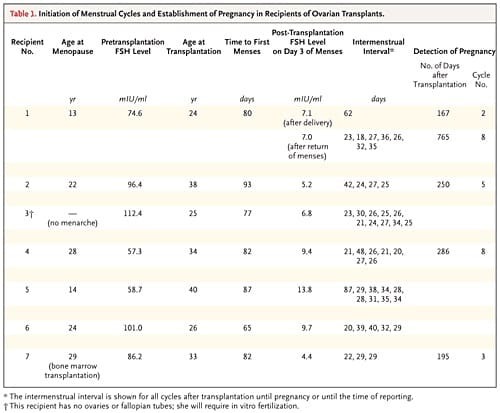 Initiation of Menstrual Cycles and Establishment of Pregnancy in Recipients of Ovarian Transplants. Genetically discordant premature ovarian failure in monozygotic twins is not as rare as we had previously assumed.2 Ten of the 11 cases that we have seen were apparently the result of congenital germ-cell deficiency, since histologic analysis verified the absence of primordial follicles and there were no other antecedent diseases or exposures associated with ovarian failure.3 Identical twins, like animal clones, are not actually identical, owing to epigenetic variations such as DNA methylation. Recipient 7 had had acute lymphoblastic leukemia more than 4 years before ovarian transplantation and had also received a bone marrow transplant (which is what caused her ovarian failure) from her sister, who has not had cancer. Unlike her sister, she also had a large nevus on her face. Recipient 5 had type 1 diabetes, whereas her twin had normal glucose levels but had a history of Graves’ disease. These are all diseases for which there is a recognized genetic predisposition4 and that were discordant in these monozygotic sisters. Our transplantation results should encourage continued efforts to bank ovarian tissue for patients with cancer, in anticipation of reimplantation after remission. More speculatively, these procedures could enable healthy women to extend their reproductive life span. Roger G. Gosden, Ph.D., D.Sc. Gosden RG, Treloar SA, Martin NG, et al. Prevalence of premature ovarian failure in monozygotic and dizygotic twins. Hum Reprod 2006;22:610-5. Faddy MJ, Gosden RG, Gougeon A, Richardson SJ, Nelson JF. Accelerated disappearance of ovarian follicles in mid-life: implications for forecasting menopause. Hum Reprod 1992;7:1342-6. Feinberg AP, Ohlsson R, Henikoff S. The epigenetic progenitor origin of human cancer. Nat Rev Genet 2006;7:21-33. Su LL. Monoamniotic twins: diagnosis and management. Acta Obstet Gynecol Scand 2002;81:995-1000. Weksberg R, Shuman C, Caluseriu O, et al. Discordant KCNQ1OT1 imprinting in sets of monozygotic twins discordant for Beckwith-Wiedemann syndrome. Hum Mol Genet 2002;11: 1317-25.